Vice President Yemi Osinbajo, SAN, has assured that Nigeria remains committed to the peace, security and territorial integrity of neighbouring countries in the sub region. 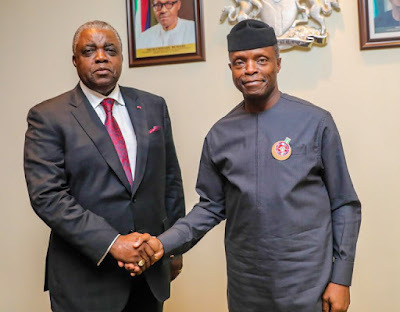 Prof. Osinbajo stated this while receiving a Special Envoy of the Cameroonian President, Mr. Rene Sadi, also Cameroon’s Minister of Territorial Administration and Decentralization, at the Presidential Villa, Abuja, on Wednesday. Osinbajo said the relationship between Nigeria and Cameroon has continued to grow strong since bilateral relations were established in the 1960s. He added that this was evident in the cooperation between both countries in the war against Boko Haram and terrorism. “We appreciate the brotherhood and respect between both countries and the leaders. That shared commitment to peace and fighting extremism is one of the reasons for the good relationship,” the VP said. He also assured the Cameroonian delegation that the Federal Government and President Muhammadu Buhari will continue to extend its hand of fellowship to the Cameroonian government to maintain the peace and security in both countries which share common borders. The Special Envoy, who delivered a special message from the Cameroonian President Paul Biya, extended the Cameroonian President’s gratitude to President Muhammadu Buhari and Nigeria’s security agencies for its cooperation in the fight against insurgency. While citing the special relationship between President Buhari and his Cameroonian counterpart, Sadi said the Cameroonian government is grateful for the support Nigeria has provided his country over the years. “Following the return to Nigeria of President Buhari after successful medical treatment in the UK, the Cameroonian people share in the joy of their Nigerian brothers and sisters to see him back home to carry on the daunting mission of nation building in very good health,” he said.